VIENNA/LONDON, June 24, 2015 – A powerful new tool for defending the European media’s right to report on matters of public interest is now available, the Vienna-based International Press Institute (IPI) and the London-based Media Legal Defence Initiative (MLDI) announced today. IPI and MLDI have joined together to publish a comprehensive reference and training manual for lawyers and journalists on European legal standards related to freedom of expression and the protection of reputation. 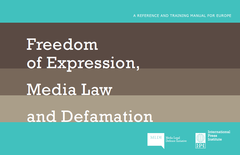 The 55-page manual, “Freedom of Expression, Media Law and Defamation,” summarises key principles of European jurisprudence on defamation and is intended to provide support to lawyers representing media practitioners who have been sued or charged with libel, while also helping journalists to understand their rights under international and European human rights mechanisms. In late 2014 and early 2015, IPI and MLDI held an initial series of workshops based on a draft version of the manual in the Republic of Macedonia / Former Yugoslav Republic of Macedonia, Croatia, Spain and Portugal. This series allowed for the manual to be tested in practice and improved following feedback from participants and trainers. Each workshop was led by a leading legal expert and participants included lawyers, journalists and representatives of civil society. In addition to the material covered by the manual, the workshops also included a session on respective national defamation law as well as an editorial training session that provided journalists with practical reporting tips for balancing respect for reputation with the public’s right to know. MLDI works extensively with lawyers in several European countries to defend cases against the media, including by taking cases to the European Court of Human Rights – the court of last resort for all European journalists who allege violations of their right to free expression set forth in the European Convention on Human Rights. IPI’s work on defamation laws in Europe includes a research and advocacy programme aimed at encouraging the adoption of defamation laws in line with human rights principles. Last summer, IPI’s report “Out of Balance” revealed that the majority of defamation legislation in EU countries falls “dramatically short” of fulfilling relevant international standards. The manual and accompanying training materials are currently available in five languages: English, Croatian, Macedonian, Portuguese and Spanish. Downloads are available here. Further languages will be forthcoming.